• Allograft – Bone from a human tissue donor obtained from a bone bank (cadaver bone). • Alloplast – Synthetic or artificial bone. • Xenograft – This is the implantation of bovine (cow) bone. A xenograft is safe and has been used successfully for many years. Ample bone can be obtained and no secondary donor site is necessary. • Dental Implants – Implants are the best way to replace missing teeth. If the jawbone lacks the necessary quality or quantity of bone, bone grafting can strengthen and thicken the implant site. • Sinus Lift – A sinus lift entails elevating the sinus membrane and grafting bone onto the sinus floor so that you have adequate bone width and height to securely place an implant. • Ridge augmentation -Ridges in the bone can occur due to trauma, injury, birth defects or severe periodontal disease. 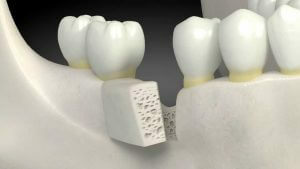 The bone graft is used to fill in the ridge and make the jawbone a uniform shape. To learn more about Bone Grafting or to schedule an appointment call Prestige Oral Surgery today at 732-297-7000.